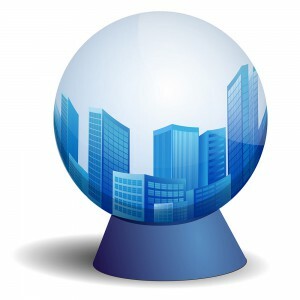 After a head spinning 2016, our property markets started 2017 with a bunch of mixed predictions. 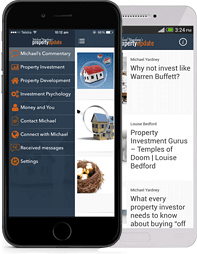 Some called a property bubble, while others forecast lower, but continuing capital growth. Well…the scorecard is in for the first two months of the year have already surprised on the upside. 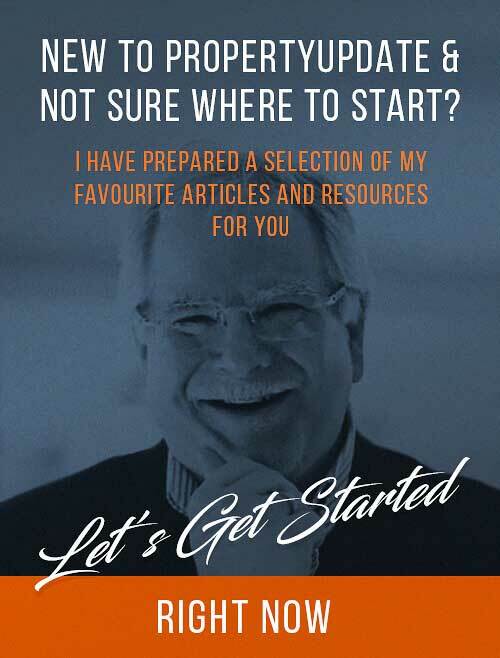 CoreLogic recently released their monthly chart pack which gives us a good overview of what’s happening as well as some of the economic factors impacting our markets. 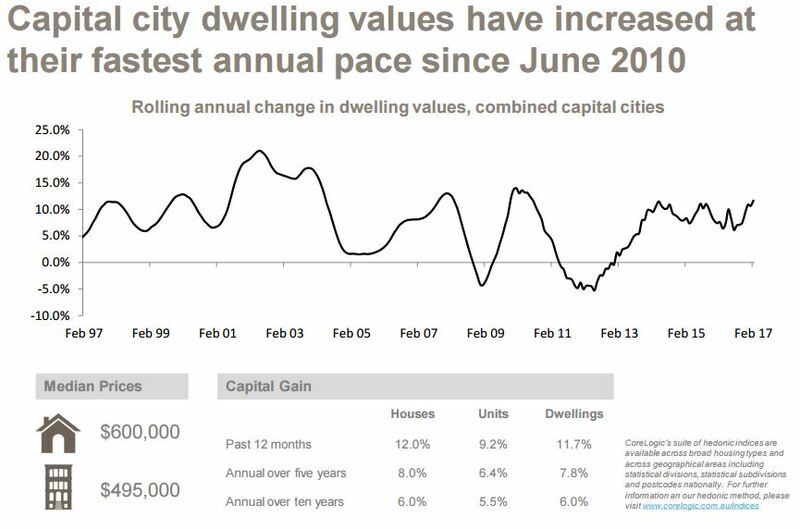 Combined capital city dwelling values increased by 1.4% in February 2017 with values higher across all capital cities except for Brisbane, Perth and Darwin. 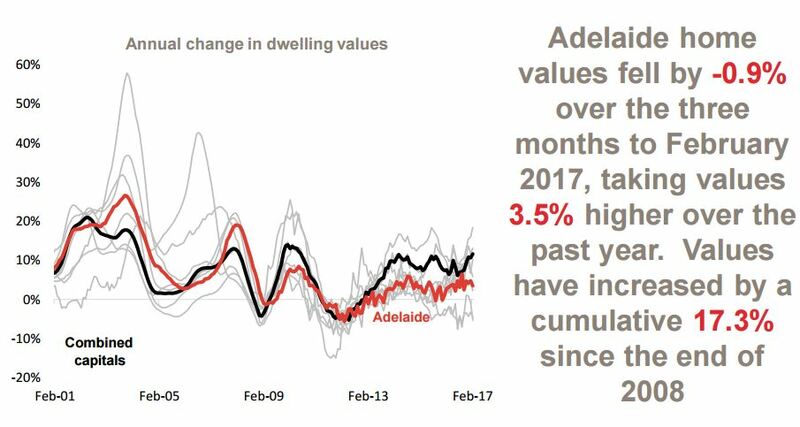 Home values were 3.6% higher over the three months to February 2017 with values rising across all capital cities except for Adelaide, Perth and Darwin over the period. 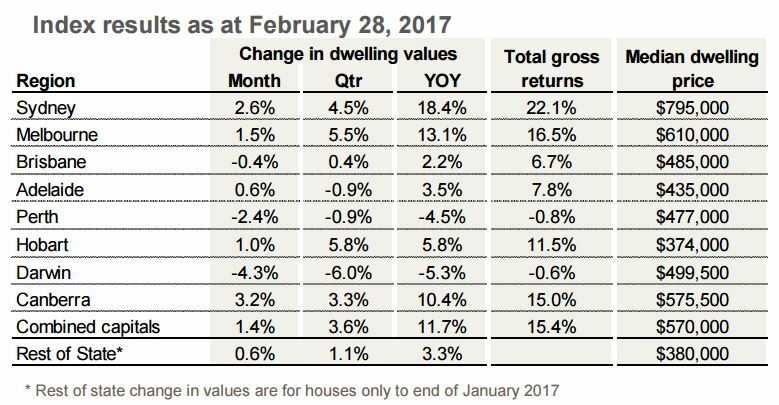 Dwelling values increased by 11.7% over the 12 months to February 2017 which was the fastest annual rate of growth since June 2010. 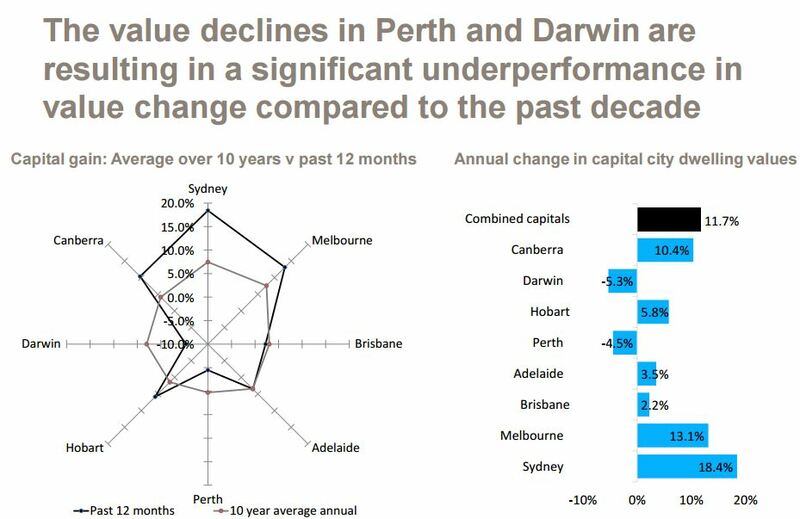 Across the individual capital cities, the annual change in home values have been recorded at +18.4% in Sydney, +13.1% in Melbourne, +2.2% in Brisbane, +3.5% in Adelaide, -4.5% in Perth, +5.8% in Hobart, -5.3% in Darwin and +10.4% in Canberra. 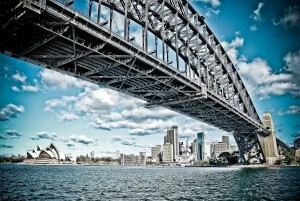 In Sydney, the annual rate of home value growth is now at its highest level since December 2002. 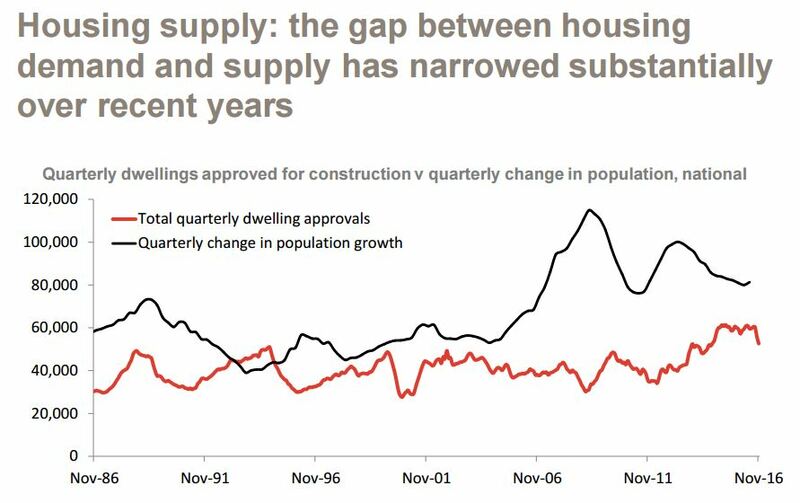 WHAT THE CHART ABOVE DOESN’T REALLY SHOW IS HOW FRAGMENTED OUR PROPERTY MARKETS ARE. 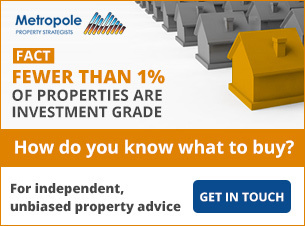 While combined capital city index, which is heavily weighted towards the Sydney property market and Melbourne property market, recorded a 11.7% rise over the last year, as you can see in the following graphic capital city growth varies greatly, with the Sydney property market once again the strongest market growing at 18.4% over the last 12 months. Over the 12 months to February 2017 it is estimated that there were 325,054 houses and 131,786 units sold and settled nationally with house sales -8.8% lower and unit sales -14.5% lower over the year. 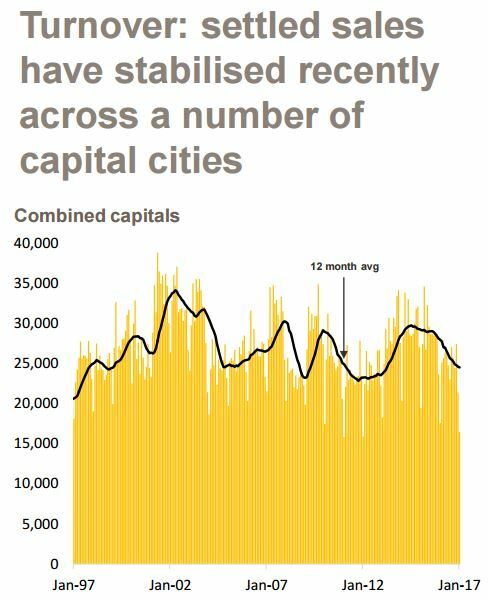 Across the combined capital cities there were an estimated 193,891 houses and 96,403 units sold over the 12 months to February 2017. 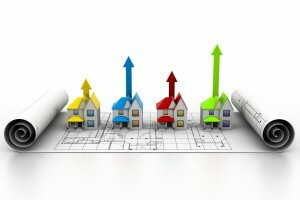 House sales are -12.0% lower over the year and unit sales are -15.4% lower. 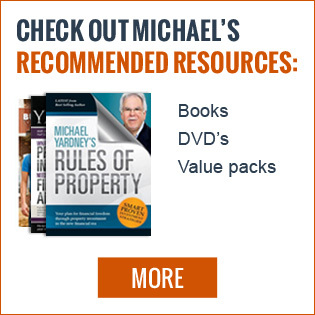 The typical capital city house is currently selling after 57 days compared to 64 days a year ago while the typical capital city unit takes 61 days to sell compared to 68 days a year ago. 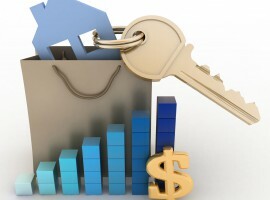 The average level of discount across the capital cities is recorded at 6.0% for houses and 5.7% for units compared to 6.1% for houses and 5.6% for units 12 months ago. 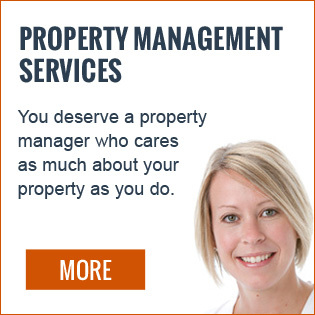 Over the past 28 days there were 48,737 new homes listed for sale nationally and 30,584 of these were listed across the capital cities. New advertised properties for sale are -2.9% lower than they were a year ago nationally and -1.7% lower across the combined capital cities. 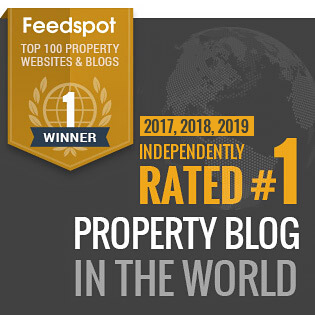 There were 231,228 total properties advertised for sale nationally over the past four weeks and 105,267 across the capital cities. Nationally, total stock for sale is -8.1% lower than a year ago while they are -3.4% lower across the combined capital cities. The strong levels of investor lending have again caused some of the banks to further restrict lending to property investors over the last few weeks, and even though the RBA has kept official interest rates on hold, the fact that some banks are raising their rates for investors, and most banks have tightened their serviceability criteria, means that many property investors will have a more difficult time getting finance this year. 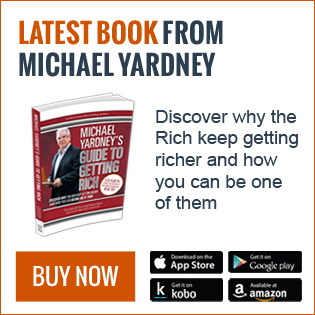 I remember how at the beginning of 2016 many were prepared to write off the Sydney property market saying that not only was the boom over, but Sydney property values were going to crash. 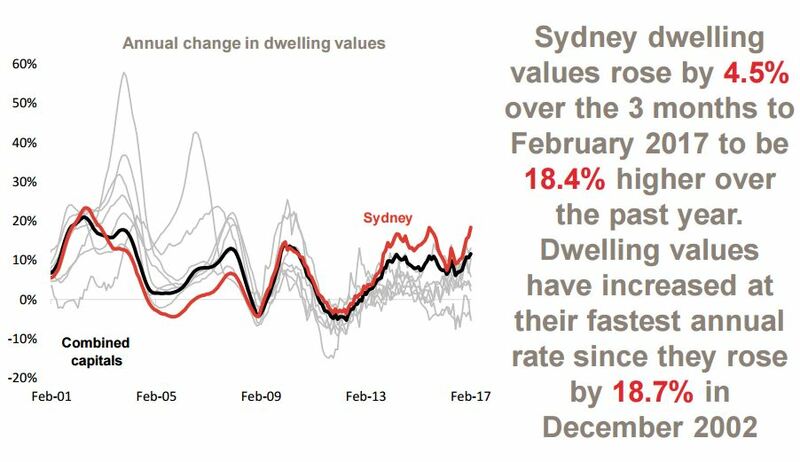 But Sydney’s fundamentals were strong and after a slight lull at the beginning of last year, Sydney’s price growth over 2016 was stronger than any other capital city finishing up 18.4% over the last 12 months. 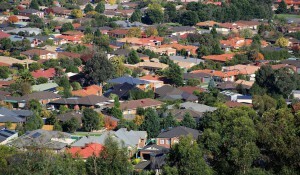 Again auction clearance rates remain above 80%, and with less “good” stock on the market at a time of strong demand from investors and home buyers, Sydney is likely to outperform again this year. 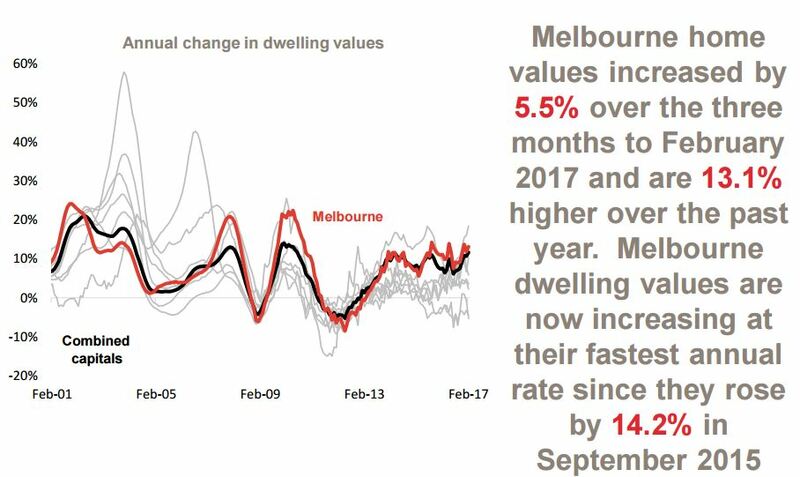 The Melbourne property market also performed well over the last year, with strong population growth (over to 2% per annum) and a relatively strong economy which created more full time jobs than any other state, underpinning its growth. 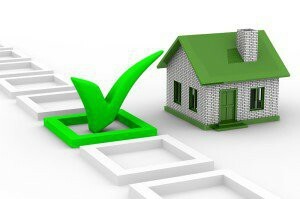 And once again the strong 80%+ auction clearance rates show the underlying strength of the local market. 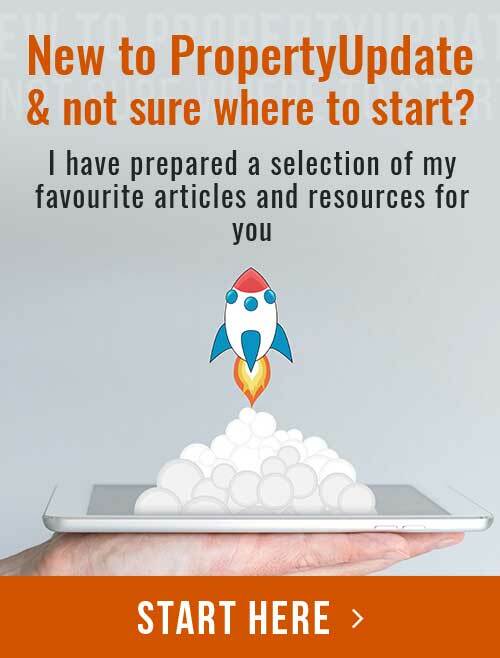 This will only be boosted later this year as the newly announced increase to First Home Buyers works its way through the market creating an established home owner’s boost. 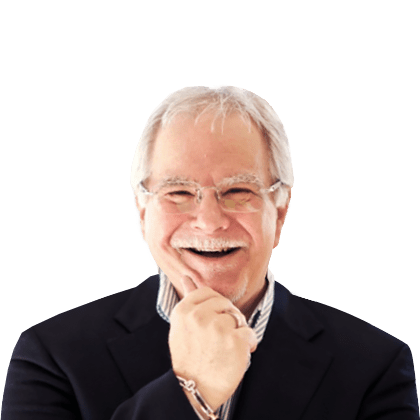 Brisbane’s property market has confounded those “hot spotters” who have predicting it was going to be “the place to be” for the last few years. 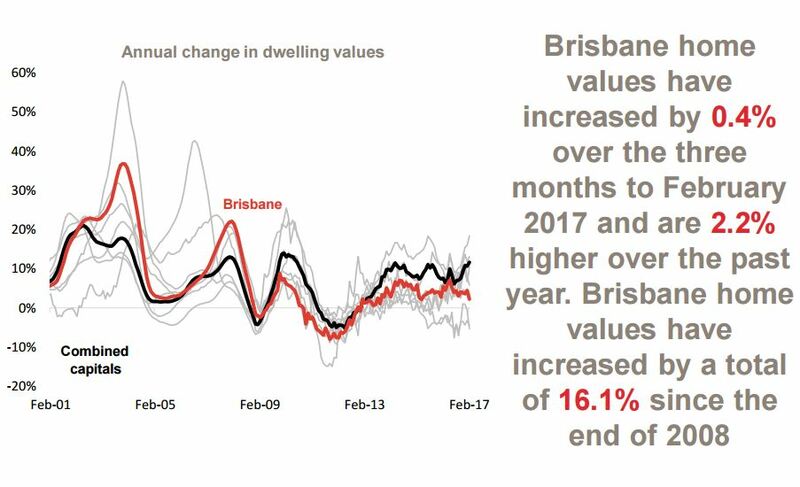 While overall growth in Brisbane was +2.2%, the market is very fragmented and there are still some areas that are performing respectably and have good investment prospects. On the other hand, there is a significant oversupply of new high rise off the plan apartments overshadowing the inner city area and nearby suburbs. 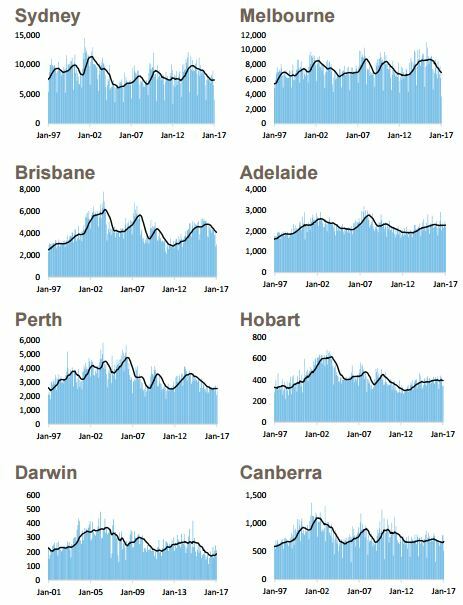 The Adelaide property market has stalled a little and home values recorded a 3.5% rise over the last 12 months. 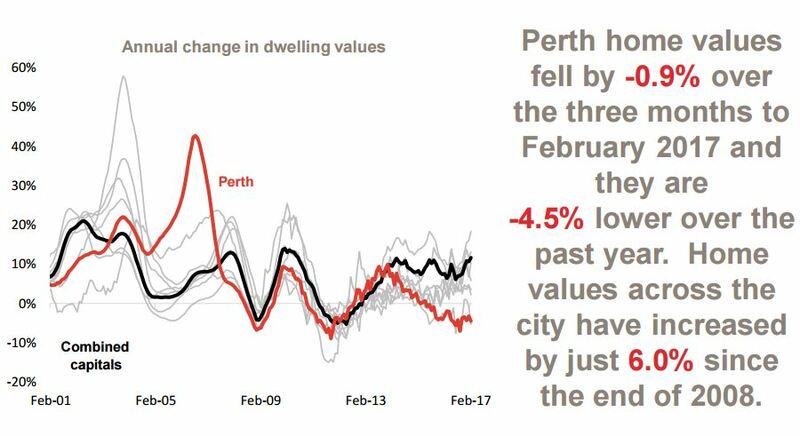 The Perth property market is still in its slump phase with a significant oversupply of properties for sale and even though values rose a little at the end of the year, overall home values finished the year lower than they started. 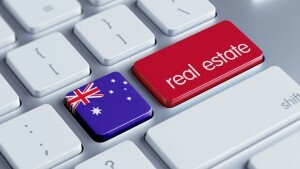 I believe there is still some downside to the Perth market as it works its way through the excesses of the mining boom. 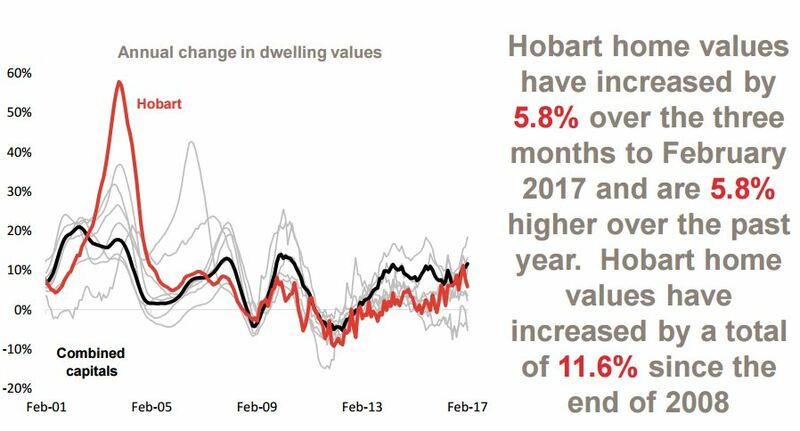 Hobart property performed well last year, and even though some commentators are suggesting it’s a good place to invest “because it has to catch up”, with minimal population growth and slow economic growth there seems little reason for property values in Hobart to grow substantially. 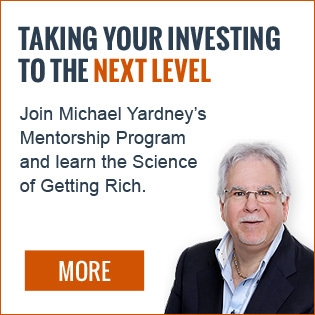 They have only increased by 11.6% in the last 8 years. 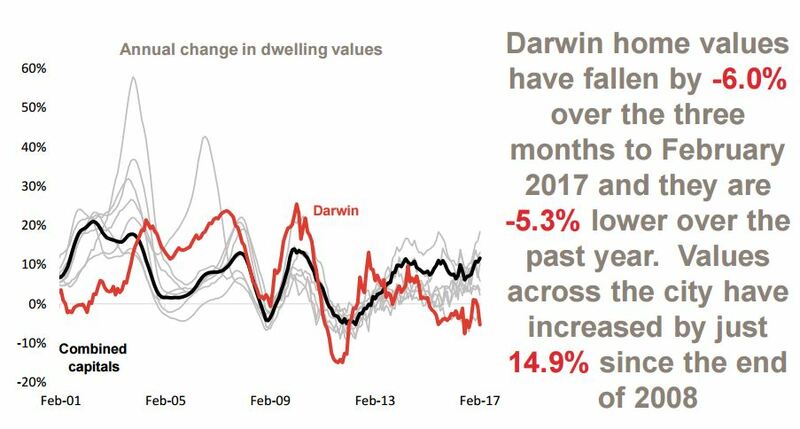 The Darwin property market performed strongly a few years ago, driven by solid investor sentiment, but their love affair with the Northern Territory is long over. 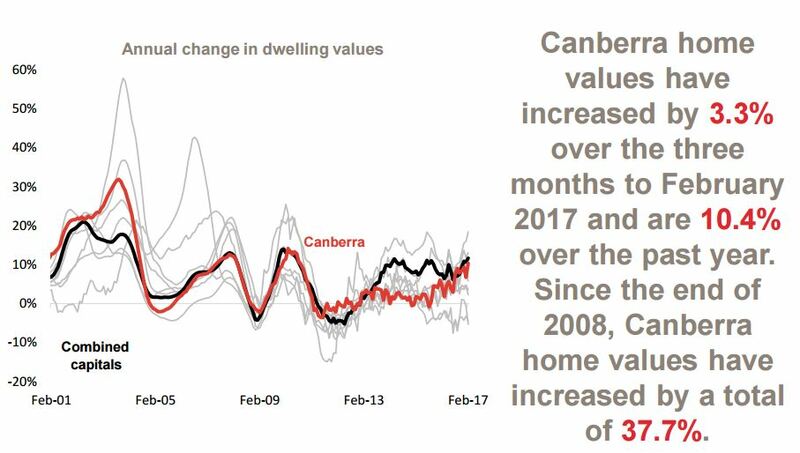 Canberra’s property market performed strongly last year and is the only housing market, other than our 2 big capital cities, where the cumulative capital gain has been greater than 30% post GFC. The rate of population growth at a national level is lower than recent highs but has steadied over recent quarters thanks to improving net overseas migration. The rate of population growth at a national level is lower than recent highs but has steadied over recent quarters thanks to improving net overseas migration. Victoria is seeing a substantially more rapid rate of population growth than all other states and territories. Dwelling approvals rose moderately in January with house approvals falling and units increasing however, overall approvals are substantially lower than their recent peak. Consumer sentiment remains at a fairly neutral setting although it was more pessimistic than optimistic in February 2017. As you can see from the charts below, there is a strong link between consumer sentiment and the strength of our proeprty markets. Although the unemployment rate has been trending lower, the economy has shed full-time jobs over the past year with all new jobs created being part-time. 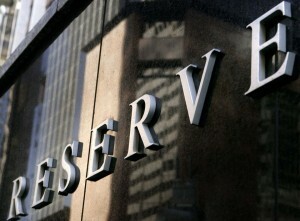 The Reserve Bank left official inter est rates on hold at 1.5% in February 2016 and the RBA Governor recently indicated that interest rates would probably be lower were it not for the strength of the Sydney and Melbourne housing markets. The value of new mortgage lending continued to rise in December 2016 however, investor demand slowed a little over the month while owner occupier demand for established housing stock rose. Housing credit data showed that credit expansion remained relatively unchanged in January 2017 however, there was a substantial slowdown in the growth of investor credit. 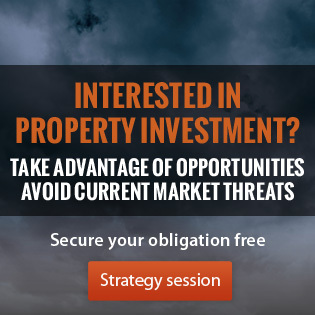 Despite our low interest rate environment, Australia’s property markets are very fragmented and driven by local factors including jobs growth, population growth, consumer confidence and supply and demand. 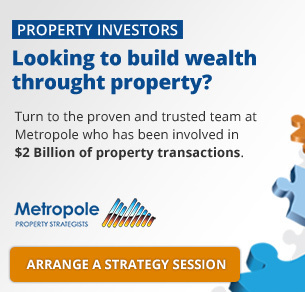 The Melbourne and Sydney property markets are likely to once again outperform the other states in 2017 as continuing demand from investors and wealthy home owners once again drives capital growth. 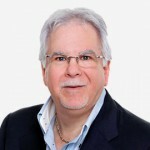 However, the looming oversupply of new and off-the-plan apartments in Brisbane, Melbourne, and to a lesser extent Perth is likely to put a damper on inner-city property values, and as always, the level of property price growth will depend on what the Reserve Bank and the banks do with interest rates.